Imagine this: The cash-strapped Ukrainian government realizes that it can't afford to buy oil at $100 a barrel so it starts lobbying Saudi Arabia to sell oil to Ukraine at $80 per barrel instead. What would happen? Everyone would laugh at Kiev and sell the oil elsewhere. But that is in effect what Kiev has been saying to Gazprom. Ukrainian President Viktor Yanukovych is unhappy with the contract signed by then prime minister Yulia Tymoshenko in 2009 and wants to reduce the price from the $388 per 1,000 cubic meters Ukraine is obliged to pay in October-December. Does this make any sense? Well a little. The big difference between oil and gas is that one can be delivered to anywhere in the world by supertanker, while the other can only be delivered through a pipe to a fixed destination. The monopoly of supply that Ukraine has over Russia is the only reason that there can be any negotiation at all over the price they pay for gas. And that just came to an end. The launch of the Nord Stream gas pipeline on Sept. 6 that runs from Russia's huge Artic gas fields to northern Germany has broken Ukraine's monopoly over the export of Russian gas to Western Europe and is a game changer. 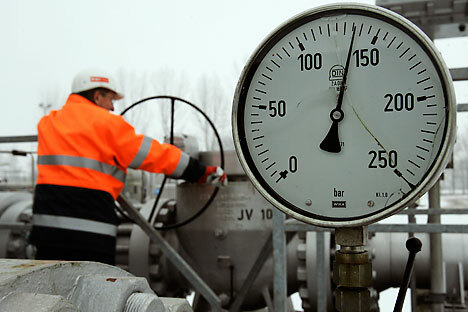 Tensions between Moscow and Kiev over the gas question are rising fast. Kiev is unhappy with the contract that Tymoshenko signed and with some cause: The delivery of Ukrainian gas is now Gazprom's most profitable business, analysts say. Moreover, the charge that Tymoshenko exceeded her authority in signing the deal — she did not seek the approval of the parliament and was not entitled to act on her own — actually look like they are correct according to Ukrainian reports. Naftogaz Ukrainy CEO Yevgeny Bakulin said Monday that he considered the price of $230 to be a fairer price, while Yanukovych said Kiev wants to take the price Germany pays as the basis of the Ukraine price, minus a $70 transit fee. In July, the cost of Russian gas at the German border was $403, which minus the transit fee would imply that Yanukovych wants a price of $333 — a bit less than the $388 Ukraine is obliged to pay next month and a lot more than the $230 that Bakulin is talking about. But Gazprom's position that Ukraine is paying less than customers in Western Europe is also valid. Gas is a commodity and so should be sold at the market rate. Not only did the West encourage the emerging former Soviet states to adopt a free-market model, we insisted on it. In the 1990s, America went as far as withholding its "market economy" status from Russia (which affects trade tariffs) because it was not charging enough for gas. Now it is charging so much that it is accused of bullying its neighbor. This battle has been running since Russia famously cut Ukraine off on New Year's Day in 2006 for not paying its bill. And it has been impossible to resolve because of Ukraine's monopoly over the delivery of Russian gas on to the West. Indeed, according to reports, Ukraine cynically cut off these deliveries to some countries in a repeat showdown in 2008 to pressure Russia even though the Russians maintained the gas flow. Nord Stream has appeared in an amazingly short amount of time — for a Russian infrastructure project. Ukraine's national gas company Naftogaz Ukrainy says it has already stored enough gas for the winter season, which means that if this year's "gas war" gets really nasty and the gas taps are turned off, at least the Ukrainian's won't freeze even if the rest of Europe does. But Ukraine wont be able to play this game for much longer. Ukraine is obliged to buy 33 billion cubic meters under contract but is asking for a reduction to 27 bcm. Gazprom says it expects to export 155 to 158 bcm to Europe this year. The first phase of the Nord Steam pipeline has a capacity of 27.5 bcm, and the second phase that comes online next year will increase this to 55 bcm so by next winter Russia can avoid exporting a significant part of its obligations to Europe via Ukraine. And Deputy Prime Minister Igor Sechin is already talking about a third phase; Nord Steam could carry 75 percent of the gas currently delivered via Ukraine as soon as 2015. By breaking Ukraine's supply monopoly, Moscow is removing Kiev's ability to negotiate over price. Better that Kiev start concentrating on reducing its famously wasteful energy use — the worst in the world — and start developing its domestic gas fields, such as they are. Originally published at the Moscow Times.